Two of these Blissfield HIgh School seniors will be crowned homecoming king and queen tonight, Friday, Oct. 4, at half time of the varsity football game against the Hillsdale Hornets. Pictured from the left in the front row are senior queen candidates Kaytlin Martinez, Claire Denecker, Kelsie Abbott and Sara Goetz. The senior king candidates in the back row from the left are: Jacob Bayer, Dakota Underwood, Dakota Suiter and Charlie Southward. Not pictured are the float riders for each class. The 2013 float riders are seniors, Brianna Yates and Josh Green; juniors, Quinn Cross and Jacob Bates; sophomores, Carlee Wanless and Charles Kaster; and freshmen Jesse Reaster and Jack Gorny. There will also be a silent auction at the game to benefit the Blissfield Athletic Boosters. The annual Homecoming parade through town will be at 5:30 p.m. tonight (Friday, Oct. 4). 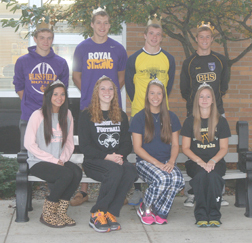 Blissfield High School 2013 homecoming queen and king candidates. Photo courtesy Blissfield High School.